A single business pitch can skyrocket a startup to success or send countless hours of work spiraling down the drain. Master of Technology Management & Entrepreneurship students at the University of New Brunswick are learning how to make the perfect pitch with help from some of the most-established and well-known business figures in Atlantic Canada. Every Thursday morning at the J. Herbert Smith Centre for Technology Management & Entrepreneurship on the university’s Fredericton campus, students have presented their ventures to a panel of entrepreneurs and coaches. The final pitch session will be tomorrow, Thursday July, 6 at 10 a.m. in TME H224, Head Hall. “These are not student projects. 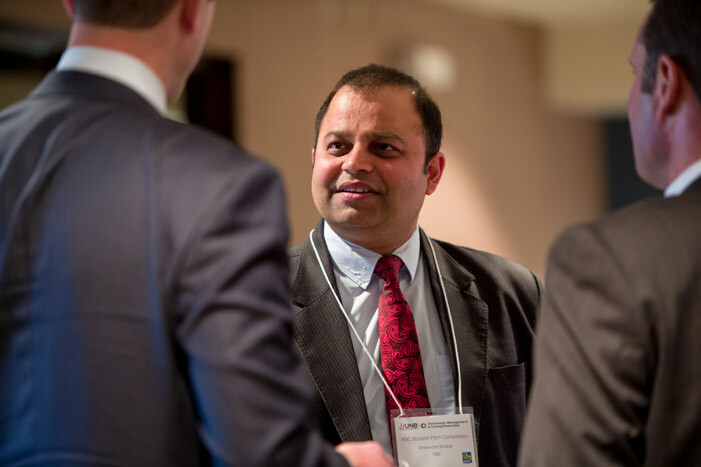 They all have the potential to be significant businesses,” says Dhirendra Shukla, director of the J. Herbert Smith Centre, named after the late Canada General Electric president and CEO who graduated from the Faculty of Engineering at UNB in 1932. “That’s a really indicative marker of the quality of the program and people attracted to it,” says Dr. Shukla. Over the course of one year, students in the program go through the process of launching a startup, either individually or in groups of up to three people. As part of the journey, the Master of Technology Entrepreneurship & Management program equips students with the knowledge, skills and confidence necessary to succeed and make a difference in industry and society. Along the way, the master’s program provides mentorship, support and feedback to help students propel their ideas forward, says program manager Phil Lambert. At the weekly pitch sessions, students sell their startups in seven-minute pitches which are then followed a 10- to 15-minute coaching period. The feedback helps students refine their ventures and pitches. This year, 13 students among 10 startups are in UNB’s Master of Technology Management & Entrepreneurship program – one of the many initiatives that support the University of New Brunswick’s reputation as Canada’s most entrepreneurial post-secondary institution. The startups aim to commercialize everything from energy efficiency products, blueberry extract, and horse milk analysis strips to whisky processing innovations and heart failure monitoring devices. Students in the cohort come from across New Brunswick, Newfoundland, Ontario, Prince Edward Island as well as India and Cameroon. The panelists have been impressed with the students’ business pitches and ideas so far. “It’s a fantastic program and hopefully it will continue to get bigger and better,” says Mr. Clark.